Oh, how times have changed. Not too long ago, I would have laughed at anyone who thought Token Shaman was an odd or interesting deck. However, in today's world Shaman is just about as least-played as you can get. Even so, not everyone is taking that sentiment to heart. In this article we are going to go back to Thrall (Morgl) and take a look at a top 100 Token Shaman list. This build has many of the old classics you love, with a few new cards thrown in for good measure. Not only that, but we're also gonna get to see why this is such a great choice for the new meta. There are a lot of viable decks right now, but nobody is quite preying on weak openings like this one. It's time to see that there's still power in the elements after all. Unstable Evolution If memory serves, we've discussed this card once before on this series. However, that was in a different place at a vastly different time. Unstable Evolution is one of those classic unfair cards that helps bring a deck from good to great. This one mana spell is basically another copy of Evolve , but with a lot more punch. The reason for that is you can always adjust it to fit your needs. Sometimes you need a big body to put on extra pressure, sometimes you need to dominate the board, and sometimes you need to create multiple powerhouses. Evolution is perfect for all three of those means and will always give you a way to stay one step ahead of your opponent. See any potential combos you have with cards in your hand, and then sculpt to them as best as you possibly can. As with so (so, so, so) many cards we cover here, you need to realize that this is not something you need to do a lot with. Yes, it is always fun to build up to some massive ten drop and laugh as your opponent hits escape for fast he breaks his (or her) computer, but most of the time this card is used to fill in your curve when you have extra mana or need to present one more threat. 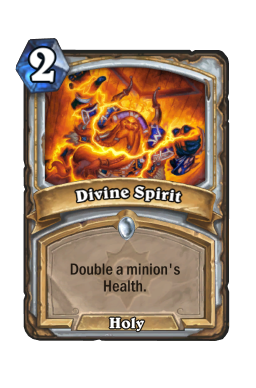 It is typically best to to hit a five or six drop to get the ball rolling, but upgrading a one health totem or a damaged early game threat can be a good use of this spell as well. 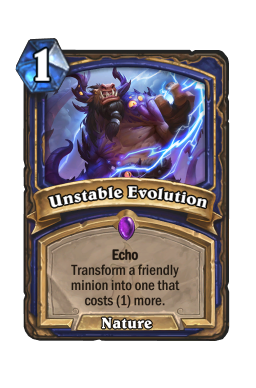 It is also important to note that, thanks to Blizzard's balance team, there are many ways Unstable Evolution can miss. Though fitting in one can be a good way to play a big turn, you typically want to have a second mana open in case something goes horribly wrong. 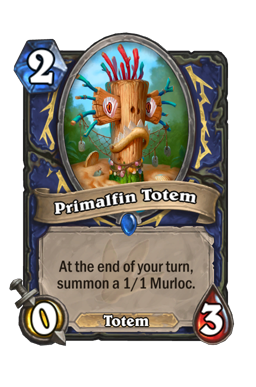 Primalfin Totem One of the reasons this deck is so powerful right now is simply because of how rare AOE or AOE-like cards are. Outside of Duskbreaker (which you can easily play around with this list) there is no real reliable way other decks handle swarms of minions. As such, your goal with this deck is to create as many bodies as possible, and no card does that as well as Primalfin Totem . The 0/3 instantly puts your opponent on the back foot and can singlehandedly run certain decks right out of the game. The reason for that is, no matter what your opponent does, this card is going to get you board presence. There is a ton of power in that, especially when playing towards things like Bloodlust or Flametongue Totem . An extra 1/1 may not seem like much, but it is incredibly useful over the course of a game. You are a list built off of being able to stick minions around, and few cards do that better than Primalfin Totem . Not only that, but this engine never stops. Churning out a single body is good, but when that body becomes two or three or four things get out of hand in a hurry. Though you don't need to go out of your way to protect this card, you typically do want to put your opponent into lose-lost situations with it. For example, let's say you play it on two and your opponent responds with a minion rather than a spell. 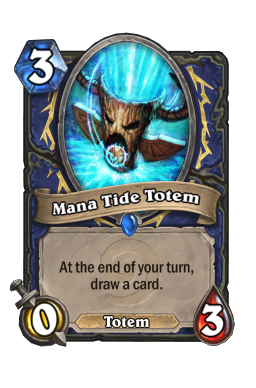 If you then drop down Mana Tide Totem on turn three, your opponent has an impossible choice. They either kill Mana Tide to limit your card draw, or they attack into Primalfin to try and limit your board. Either way, they're toast. That is the power of this card and one you should look to exploit as much as possible. Thrall Deathseer The big bad himself, Thrall Deathseer is an incredible powerhouse in this build. So much so, that the deck wouldn't work without him. The reason for that is the Death Knight has two very strong modes. The first is an instant threat generator. 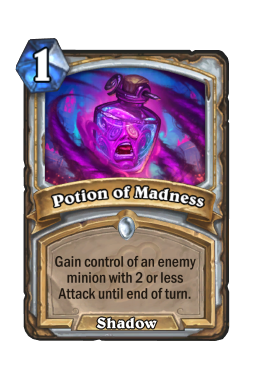 Dropping this down with any two minions is going to create a ton of pressure on your opponent (not to mention when you use it turn ten alongside Doppelgangster ). 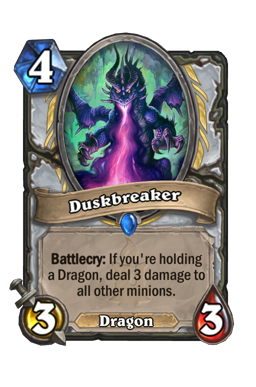 However, what makes this card tricky is, unlike other Death Knights, you don't just run it out as soon as you possibly can. This is a card you want to work to and something you only want to use when you have a good window. Losing your totems (and thus Bloodlust potential) can be a big deal if your opponent is going to be able to answer the five drop right away. Only change heroes when you need to press the advantage or you know your opponent won't have a good answer. The other half of Thrall Deathseer is his hero power. 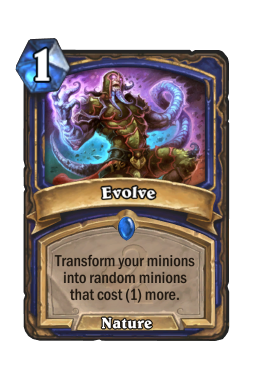 Being able to evolve certain minions is great, but the threat of being able to evolve them over and over is even better. What makes the hero power so strong is that your opponent has to spend all of their turns killing minions. If they try to chip something down or can't answer a threat, you just move it to the next mana level on the following turn. That threat constantly looms and it is going to stretch your opponent extremely thin. This is one of the best ways to grind down midrange decks. 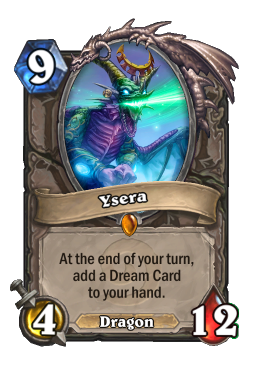 Another bonus of this card is that it turns all of your topdecks into instant powerhouses. 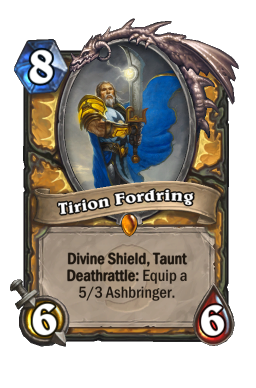 Though not everything is going to change into a Tirion Fordring or Ysera , every card you play can evolve into something stronger. And, if your opponent doesn't immediately react, it will evolve again. 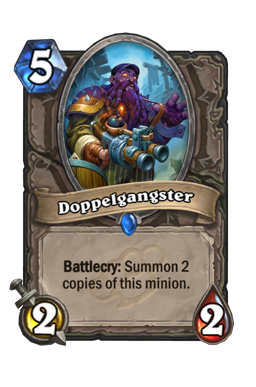 Doppelgangster It never ceases to amaze me just how powerful this card is with Evolve or Unstable Evolution . This combo is one of the oldest around, but I wanted to deconstruct it. You are a tempo deck (more or less) and that means your whole goal is to press the board in a way that gets you out ahead of your opponent. To keep that up, you need to be able to make plays that instantly give you the advantage. 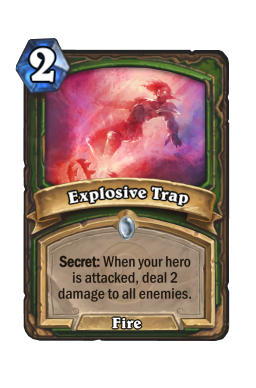 This card is the best way to do that and will instantly lead to a win against any midrange or aggro deck that doesn't have an immediate answer. I'm not kidding. If you ever have a chance to create a board of six drops, do it immediately. However, also be patient. While most cards in this deck can simply be run out for value, this is a play you want to carefully craft. The only time you should play the gangsters without a combo piece is when you're up against another fast deck and need to get some extra bodies to work with. Remember, you can always Evolve these, even if they just sit around. Your opponents may respect that, which can cause them to slow down to trade into them. Even if the 2/2's don't get an immediate reaction, the ability to work with three bodies with things like Flametongue Totem is very powerful. Aya Blackpaw We finish on the Jade Queen herself. 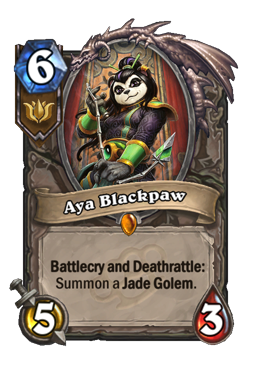 Aya Blackpaw has consistently been one of the best cards in the meta since she exploded onto the scene. Though there are several reasons for that, I'm not bringing her up to talk about her power. Rather, I'm bringing her up in order to discuss the idea of how tempo works in this deck. 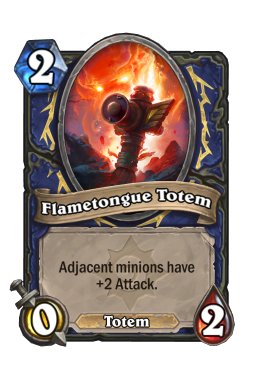 When looking to pressure your opponent with Token Shaman you need to make it so every single board you create is a threat. 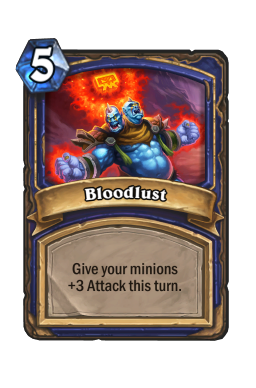 Everyone knows Bloodlust exists, and that is going to terrify most players. Even if you don't have the five mana spell in hand, you constantly want your opponent thinking about it. For that reason, any card that makes tokens is extremely strong and demands an answer. Aya is special to that end because she demands two. Know this, and use her whenever you want to bluff Bloodlust. This will cause your opponent to react, giving you a chance to strike. Aya Blackpaw is interesting because she is largely the opposite of Thrall Deathseer. That is because, you don't necessarily need to plan her out. The general rule is, if you're ever even or ahead, you slam her down no questions asked. The deathrattle is always relevant, and it will help you take down any decks looking to get a good clear in. In fact, while pressure is good, Aya is best as an insurance policy. If you ever worry about going too wide or think that you're too susceptible to mass removal, simply drop the legendary panda down alongside your board. 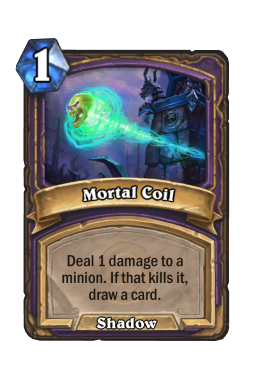 Even if your opponent can answer your minions, you'll still have something stick around that you can then Evolve or use to get in further damage. The four decks I see the most while playing the ladder. Control Warlock As you can imagine, Warlock is one of the trickiest matchups out there. While definitely winnable, this is the game where you need to be consistently aggressive. It is easy to get into a pattern where you try to set up bigger plays, but pressure should always be prioritized. The reason for that is, your opponent wants to tap into big minions. If you can get early pressure going it instantly forces them to react to you, which stops their plan. If they continue to tap, you can then use that damage against them. Just be careful about AOE whenever you can. It is not fun to get your board cleared, but you can easily play around it by dropping down single card threats like Primalfin Totem or Aya Blackpaw . As Warlock spends so much time damaging themselves, you should have no problem killing them with just a few cards. Don't worry here and never overextend unless you have no other option. The way you play this game is going to almost always depend on how you start out. If you can hit the ground running and get your minions going early, then you want to be extremely aggressive and work to push towards an early finisher. However, if you go a little slow, you need to adapt into more of a midrange style build where you play to your bigger combos like Doppelgangster or Thrall Deathseer. Just be aware, no matter how you pace this one, you're trying to set up Bloodlust at all times. Warlock has AOE, but you will eventually get to a point where they can't answer you. 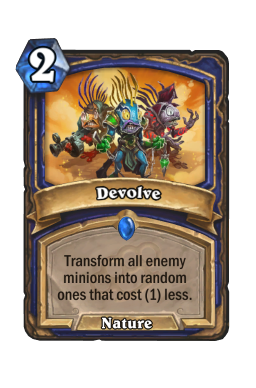 You also need to save Devolve at all costs. 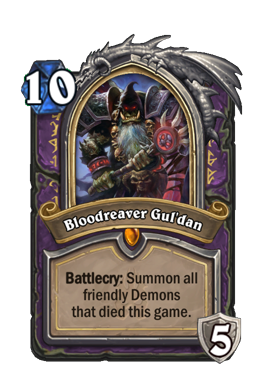 Not only only does the spell ruin Bloodreaver Gul'dan , but it helps you cripple their early combos. Combo Priest Right below (and I mean right below) Warlock is Combo Priest, which seems to be absolutely everywhere these days. The dragon package is nothing short of insane, and that makes the combo extremely reliable. This game is going to be a tight board battle where you're trying to do everything you can to make sure your opponent can't leverage their combo. 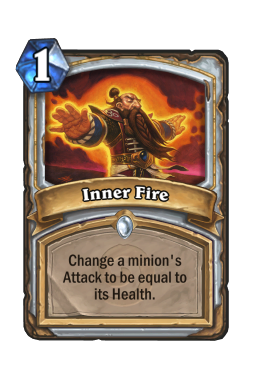 Inner Fire and Divine Spirit are extremely strong together, especially in a deck that fights for constant board presence. You want to do everything in your power to keep your opponent from sticking a big threat. While your removal does a good job against smaller threats, Devolve is the best way to answer a big buff. Never pull the trigger on the spell too early. Rather, wait for your opponent to boost a minion's health and then shut it down. It is also important to note that, while you need to watch out for your opponent's combo, you never want to let it control the game. That is to say, you should be cautious about it, but don't cripple your own plan out of fear. That will make so you lose eventually anyway. Rather, get out your minions and force your opponent to try to set up their own trades. The final rule of this game is to watch out for Duskbreaker . The 3/3 dragon can ruin you if you aren't careful. Rather than allowing it to blow you out, you want to go hard for bigger board. Doppelgangster is the best way to shut your opponent down, as is Thrall. 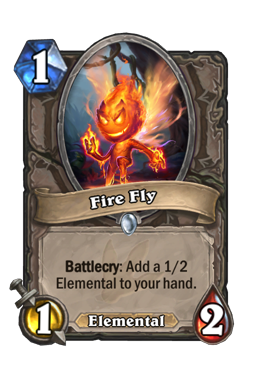 If you do have to commit, try and commit cards that will bait out removal on their own (like Primalfin Totem or Aya Blackpaw ) rather than pushing out multiple cards. You can wear your opponent down here. Don't try to everything at once. Aggro Paladin I hope you like fighting for the early board. 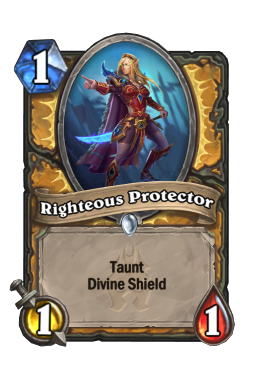 Aggro Paladin has been around a good while now, and this matchup is going to play out like it always has. That is to say, it is all about the first three or four turns. While Paladin can get out on the board early, most of their minions are small. 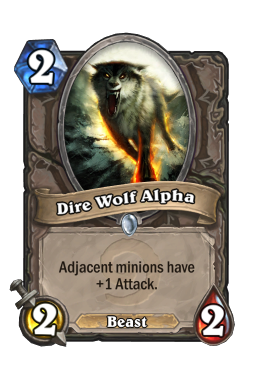 That means, outside of an turn two Dire Wolf Alpha (which you should always plan for) they are going to be trading up to you. There is no reason to be fast in this game. Trying to do too much will simply cause you to panic. Rather, you want to make it to that you pick off all of your opponent's early minions. Once you get out of turn four, you can then begin to press your advantage. Doing anything else will just leave you exposed to a big turn. 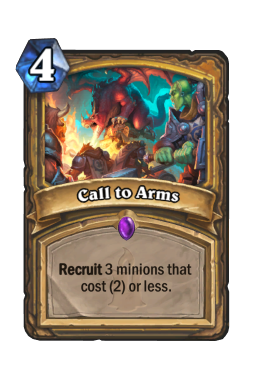 Paladin's only comeback card in this matchup is Call to Arms . If they lose the board early on and can't leverage the four mana spell they are almost always going to die. For that reason, you want to bulk up your board as much as possible on turn three. That should then give you plenty of ways to trade. 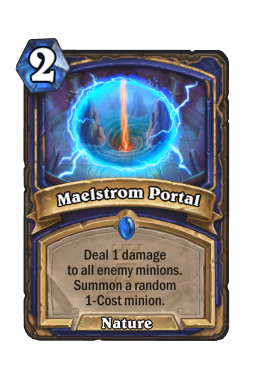 Also, don't be afraid to get greedy with Maelstrom Portal . The AOE is your best swing play, and using it at the right time will ruin your opponent. Just pull the trigger before your opponent has a chance to either use Level Up! 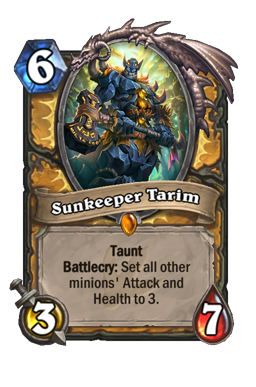 or Sunkeeper Tarim . Don't take Devolve for granted either. It is a fantastic spell against Murloc Paladin because of how hard it cripples their synergy. It also shuts down Dude buffs as well. Hunter Finally, we have Rexxar. I find that, on average, this one is going to fall in your favor. There are a few reasons for that, but the biggest is Hunter just doesn't have the ability to keep up in the early turns. Most of the time you're going to jump out ahead of your opponent (which is never where Hunter wants to be) and then use that advantage to wrap things up before they can ever get to their bigger plays. 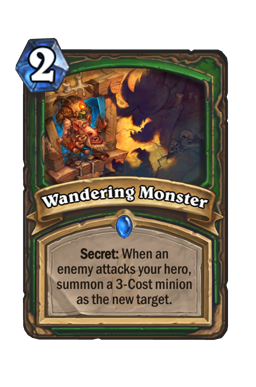 Hunter has ways to control the board, but those are largely reactive and don't create minions. That puts you in a great spot. Be very aggressive here, and do everything you can to put on pressure. 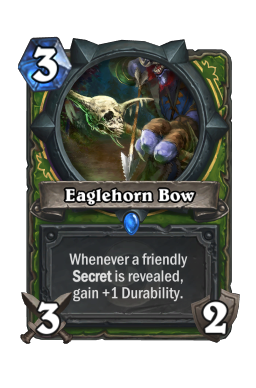 For example, slamming a turn three Flametongue Totem alongside two small bodies to get your opponent to use Eaglehorn Bow instead of a minion is a good way to move up your curve while also making sure your opponent is off their plan. The only card you want to be hyper-aware of is Wandering Monster . You have a lot of small threats, which means you never want to attack into the early secret and give your opponent board presence. If you see the question mark on turn two, it is often best to wait. 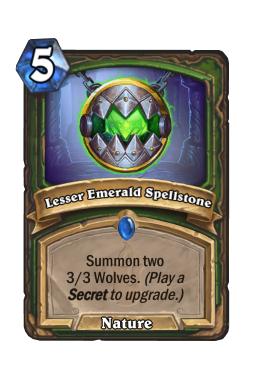 The only other big play Hunter has is Lesser Emerald Spellstone . Do your best to beef up the board by turn five. You can take the Shaman out of the elements, but you can't take the elements out of the Shaman. This mulligan, regardless of what you're up against, is the same it has always been. You need to get out early and use the pressure to push into a curve. 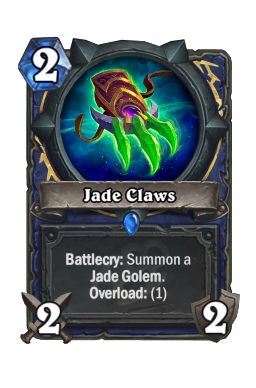 Fire Fly , Jade Claws , and Primalfin Totem are the three cards you want every game. 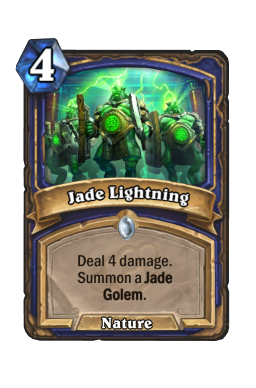 From there, look for Mana Tide Totem and Jade Lightning on curve. Devolve is a must keep against Warlock, Maelstrom Portal is for aggro, and you can keep Unstable Evolution or Evolve if you have a wide opening against a slower build. Another day, another totem. It has been so long since we've been able to play some Shaman, and I'm happy to return. While this deck is not groundbreaking, there is certainly a space in the meta for anyone who wants to take advantage or weak or slow early boards. The nerfs took a lot of tempo out of the game, and this preys on that. I always like decks that take advantage of holes in the meta, and this is certainly no exception. I hope you enjoy it as much as I do. Until next time, may you always evolve into the answer you need.